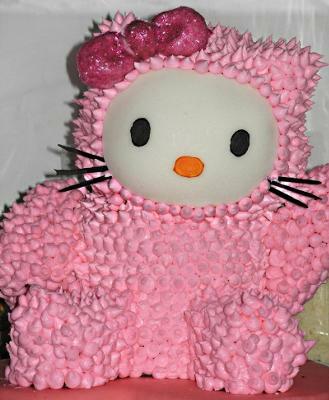 This was such a cute Hello Kitty cake that I contacted the creator and she said this was a recipe idea from Fun and Fancy Cake Decorating Tips and Techniques by Kate Sullivan. This was created using three cakes, a round, a square and three ball halves. Butter cream icing, royal icing and fondant was used to decorate the cakes. Toothpicks and skewers were used to attach the pieces for decorating and removed prior to serving. This should be done in two or three days so that the cakes can cool completely. 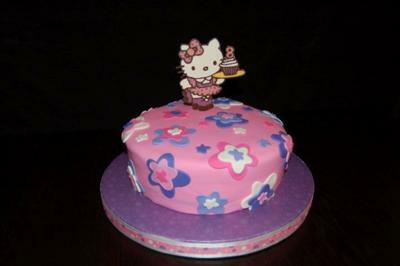 Fondant is used for the face and pink butter cream is used for the pink snowsuit using a round decorating tip. Face, eyes and nose are attached with Royal icing. For full instructions and tips and template, make sure to check out this wonderful book!